Welcome to the museum that is always open to explore... Step inside the pages of this beautiful book to discover galleries of galactic matter, expertly curated to bring you the experience of a fascinating exhibition from the comfort of your own home. Planetarium features all aspe... read full description below. Welcome to the museum that is always open to explore... Step inside the pages of this beautiful book to discover galleries of galactic matter, expertly curated to bring you the experience of a fascinating exhibition from the comfort of your own home. Planetarium features all aspects of space from the Sun and our Solar System, to the lives of stars, the milky way and the Universe beyond. 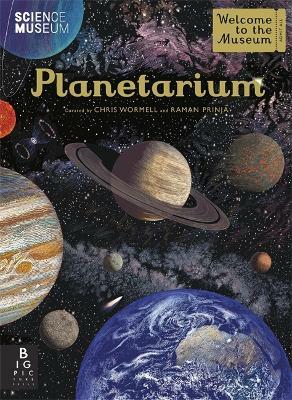 With stunning artwork from Chris Wormell and informative text by Professor Raman Prinja, Planetarium is the perfect gift for anyone with an interest in this fascinating field. Raman Prinja (Author) RAMAN PRINJA is Professor of Astrophysics at University College London, where he specialises in massive stars, star formation and the evolution of galaxies. He is a multiple winner of UCL faculty and department teaching awards. Raman is keen to bring the subject of astronomy to a wider audience and has written several successful books on the subject, including Night Sky Watcher which was shortlisted for the Royal Society Young People's Book Prize in 2015. Chris Wormell (Illustrator) Chris Wormell is a self-taught engraver and celebrated printmaker. He creates his timeless illustrations using wood engraving and linocut, as well as digital engraving working with tablet and computer. Chris has written and illustrated many children's books and most recently gained recognition for the cover illustration of the award-winning bestselling H is for Hawk, by Helen Macdonald, as well as for Philip Pullman's La Belle Sauvage: The Book of Dust Volume One.